The Offender and his friend,the Unoffended Offended. Forest Thomer II says he was conducting “guerrilla marketing” when he went to a May 23 “Party in the Park” hosted by the local Cincinnati Chamber of Commerce. 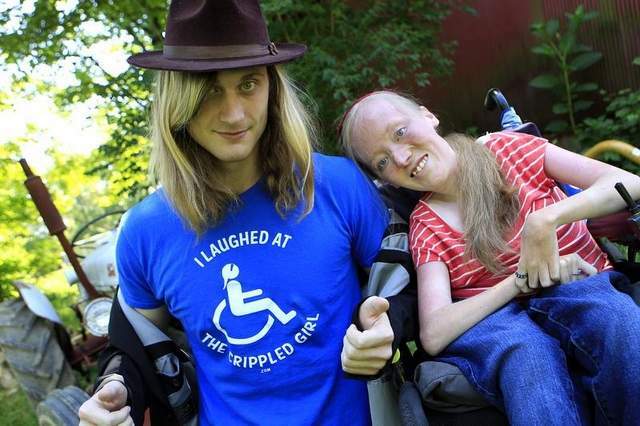 Pointing to Ally Bruener, wheelchair-bound because of Muscular Dystrophy, he quizzed various groups in the crowd, asking, “Do you want to laugh at the crippled girl?” Then Bruener, who is an aspiring comic, wheeled up, told a joke and announced the location and time of her next performance.